Written by Janet Choi on September 3, 2015 . Early on in the life of StatusPage.io, their conversion rate from trial to paid sat at 5%. When you’re a new company, no one knows about you. You move mountains to get 100 people in the door. Thirty days later, only 5 of them become paying customers, and you have to get back to mountain-moving to bring in another 100 people. That can hurt. The bright spot for StatusPage.io was that when prospects did dig into the product and go through the somewhat lengthy setup process, they stuck around. In the life of the company, average monthly churn has never gone above 3%, and over the last 8 months, they’ve performed at 1% churn. 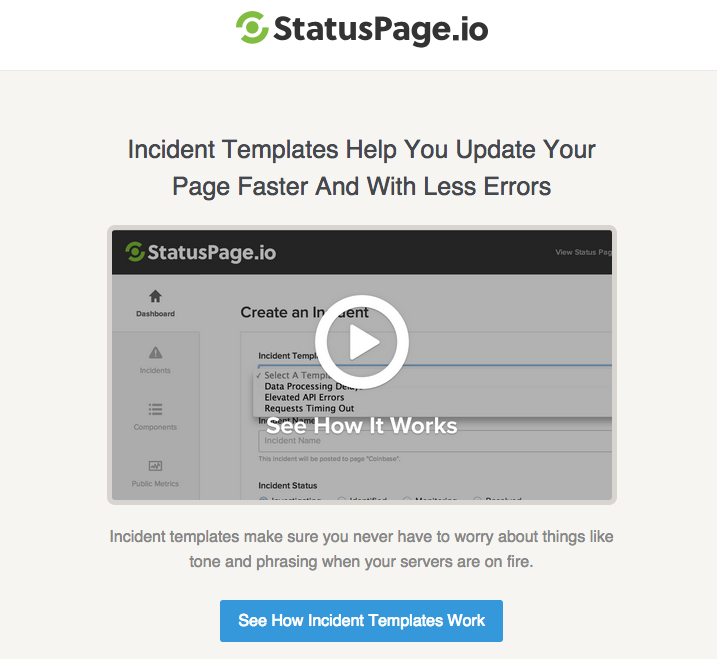 The StatusPage.io team knew that they’d built a useful product that filled a real need. They just needed to get customers to really try the product to get to that realization too. So they turned their focus to improving their trial onboarding, and those changes ultimately increased their conversion rate by a whopping 2.4x from 5% to 12%. Here’s how they did it. 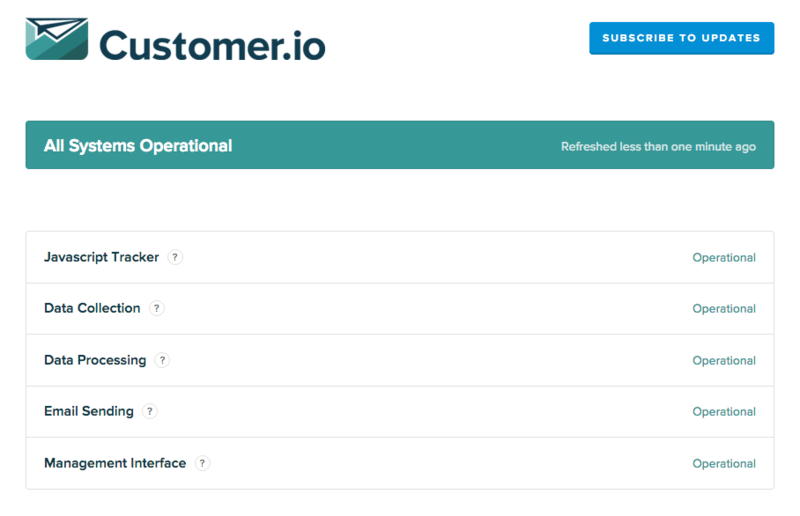 Customer.io’s status page The activation focus during StatusPage.io’s onboarding period is getting customers to set up this public-facing web page. In fact, you won’t get prompted to pick a plan and start paying for the service until this page is ready and you hit “Activate My Page.” The team noticed that certain concrete steps taken during onboarding correlated highly with conversions from trial to paid. Actions like adding a metric to display on the page, adding a “chatops” room for internal communication on server status, and inviting several team members indicated that the user was actively using the product and integrating it with their systems. This insight gave the team the idea that drove their subsequent onboarding design and 2.4x improvements. They created an “activation score” for each user that tracks onboarding progress. When users perform specific actions in the app, their activation score increases. More significant setup like adding a team member is weighted more heavily than a smaller task. While the number isn’t incredibly scientific, it’s incredibly useful and lives in the company’s admin dashboard to provide context when chatting with customers and for lead scoring. What’s most important about the activation score is that it gives the company a focal point — one single number that they aim to maximize for each user during onboarding. To maximize their activation score, StatusPage.io’s created its drip onboarding campaign in Customer.io to focus heavily around video walkthroughs that show off just 5 features in the app. When a trial user watches a video about a feature and then sets it up on their own page, their activation score increases. In the past, StatusPage.io had included case studies and links to blog posts in their drip series. But switching to these more feature-focused emails made more sense for their trial users. Why? CEO and co-founder Steve Klein explains, “People who sign up have at least bought into the idea of having a status page or get why it’s important.” So the goal of the onboarding emails is to get people to try as many of the key features as possible, not necessarily to provide additional context, background, or philosophy. Notice that even though their drip emails could amount to as many as 10 emails, the campaign isn’t scattershot. Each pair of emails corresponds to a single feature. And the second email in the pair is conditional, so that it only gets sent if the prospect didn’t convert and carry out the desired action. In general, people who have an activation score above a certain threshold within the first few weeks after signing up are significantly more likely to convert to paid. Nevertheless, the fact that they continue to win customers 90 days after first signing up to try StatusPage.io speaks to the power of steady communication around your product’s value prop.